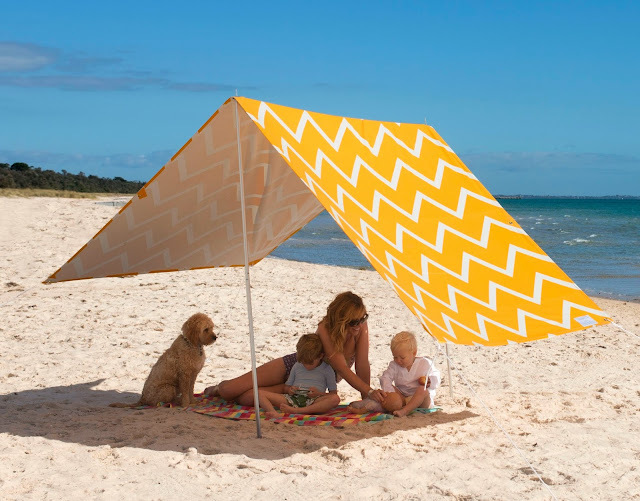 No sweaty tents, no ugly blue plastic – we love this brilliant beach shade idea from Melbourne company Hollie & Harrie. Called the Sombrilla, the shade provides plenty of sun protection but allows the sea breeze to waft through - and doesn't seem to block the view of other beachgoers. The Sombrilla is the result of a brainwave had by two friends looking for an effective yet stylish way to keep their young families protected from the sun in summer. Their beach shade solution is made from 100 per cent cotton, comes with a handy carry-bag and can be adjusted throughout the day as the sun moves across the sky. With stockists now all over the world, it's incredible what a little Aussie sun can do to get us thinking of neat ways to stay safe and surfside. Warm Weather = Lemonade Time!